As a business owner, you make sure that your customers and employees are comfortable. Here are some common commercial HVAC issues and how to fix them. Air quality can be affected by many factors. These can be as simple as a dirty air filter, or as serious as a gas leak. The culprit behind odors emanating from your HVAC ducts can be dirty air filters, condensed stagnant water, debris melting on the heat exchanger, or overheating parts. Filters should be changed out monthly. Have you ever had a problem where the CEO’s office is freezing, while the area around the receptionist’s desk is boiling hot? This can be because of cracks or leaks in your ductwork. If you suspect that your ductwork is cracked, contact us. We can locate the source of the leaks, and fix the problem. 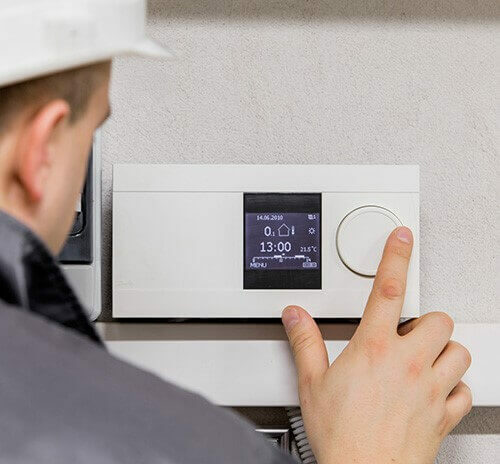 If your HVAC system has started making noises, it may be time to contact us. There may be a broken fan or a piece of ductwork that has rattled loose. Whatever the cause, we will fix the problem and get your HVAC system running smoothly again. There are times when the system installed for your office space will be either too large or too small for your needs. If your system is too large for the building, it will potentially run inefficiently. Conversely, if the system is too small, it will not be able to efficiently cool or heat the space. If your HVAC system seems to have lost its oomph, it may need minor repairs. Your evaporator and condenser coils may need cleaning if it’s been longer than six months, or your dampers may not be operating properly. If the dampers aren’t clean, they can get stuck in a certain position, which can either prevent the unit from utilizing outside air to cool the interior, or overloading the cooling coil with an excess of hot outside air. The drain line routes excess water and condensation away from the HVAC unit. Over time, drain lines can accumulate dirt and algae, and become clogged. When this occurs, water can back up into the drain pan, causing it to leak out and cause water damage. Periodic checks and cleaning of the drain line should prevent any water from backing up and causing problems. Just like cars, HVAC systems require regular maintenance. Maintenance contracts can prevent costly repairs, by detecting small problems before they become big problems. Many HVAC issues stem from negligence, and can be prevented with routine maintenance inspections. Fuses work by protecting sensitive electrical components from overheating, and can be found in the evaporator coil. When your HVAC unit shuts off unexpectedly, the circuit breaker is the first place you should look for any issues. There are two capacitors in an HVAC unit: start and run. If either of the capacitors burn out, the unit will not start or run properly, and will need to be replaced. If you are experiencing any of these or any other issues with your commercial HVAC system, contact the Severn Group. We’d be glad to help you solve the problem, and keep everyone comfortable in the coming cold months.